Filed under Luxury Rewards, Send Flowers, Uncategorized. Attention all Calyx Flowers Luxury Rewards members! Our August Summertime Lilies Promotion is running now through Friday, August 27. Enjoy a special savings of $30 OFF fresh Summertime Lilies with a perfectly coordinating pastel vase. 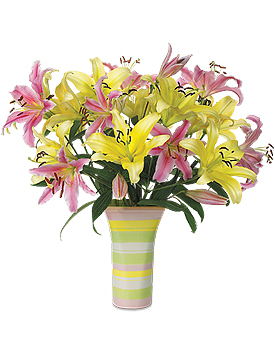 Lily bouquets are simply wonderful flowers to send for any occasion – birthdays, anniversary, get well or just because. Hurry! Quantities are limited. Did you know? With more than 100 species, the Lily has been in cultivation for centuries, and has acquired many religious and mystical associations. Known as the flower of the Virgin Mary, the Lily has long been thought to represent purity.